Click here to contact Charles. Update June 29th 2010,Charles has started working on the Motomower,last 2 pic's at the bottom. 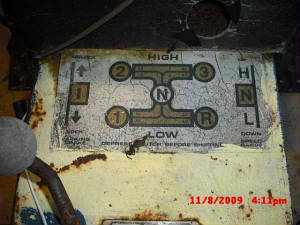 Update November 25th ,09 Charles sent a cool pic from a long time ago info is below in his email. 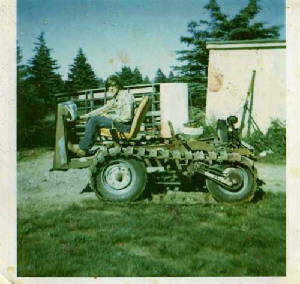 I am sending you another picture of a very rare tractor….was only ever one made, it is a combination of a VW Bus and Austin Wheels and regular tractor half tracks. The engine was the VW air cooled bus engine and transaxle assembly, the front wheels were secured straight and steering was accomplished with brakes. allowed it to crawl very slowly when in first gear but it would climb over most anything that was in its path ! Intended for it, so I purchased it and got it running again and had lots of fun with it. This was purchased locally between the years 1965 – 1970, not sure of the exact year. 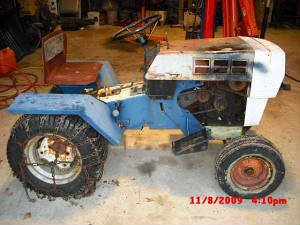 Was wondering where I may purchase parts for this tractor or are parts even still available ? I still have the original owners manual with complete parts break down. 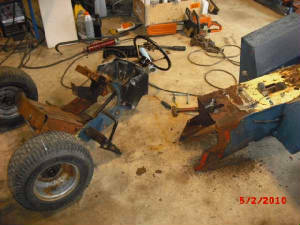 It pretty much all there but has not been used for at least 10 years now and was setting outdoor in the weather and lot of things have rusted up and I am sure a few items may break once I start on it. Also require new decals but they can always be made up at a sign shop if they are not available. 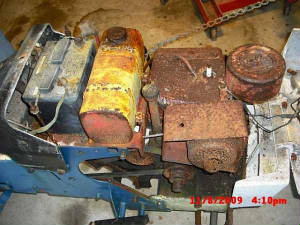 The engine still turns freely and the engine did start a few years ago. 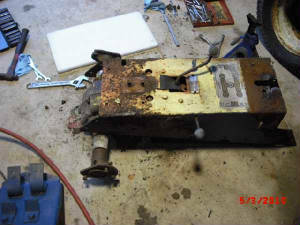 The plan is to restore it and use it again, it was always a good tractor and we did a lot of work with it years ago now. June 29th 2010,Charles has started restoring his motomower his email is below. 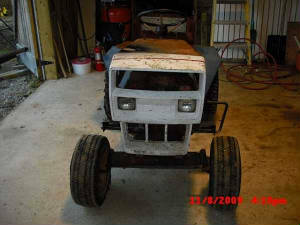 Here is an update on the tractor progress. Have it all apart on the shop floor at the moment. Slowly getting it cleaned up and then put it back together again.